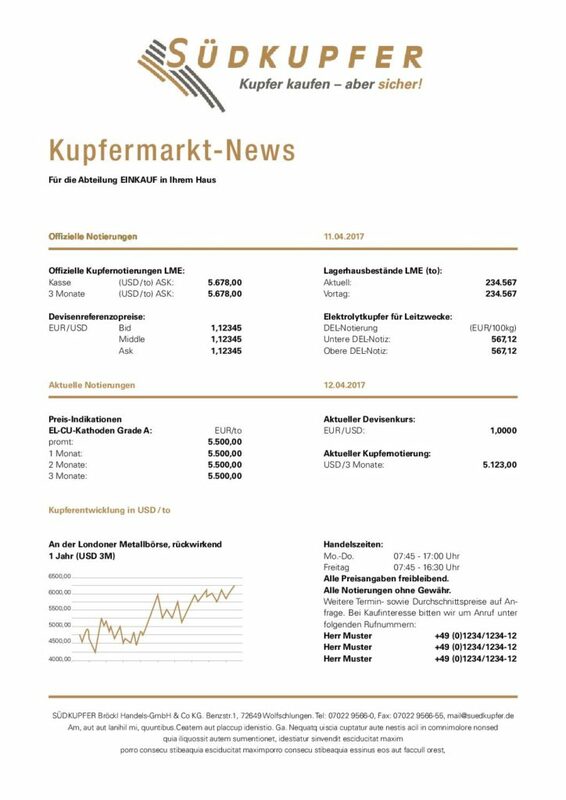 UP TO DATE EVERY DAY: THE COPPER MARKET NEWS. THE MARKET PRICES OF COPPER - UPDATED DAILY. If you buy copper regularly, getting the daily key information on copper is certainly relevant for you. 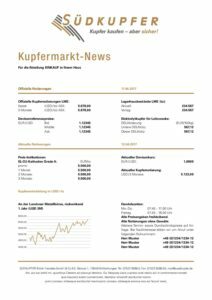 The copper market news comprises the official copper listings of the LME, the warehouse stocks, current copper prices and exchange rates EUR/USD as well as copper price developments. You can call up this page every day or choose to receive this information conveniently by e-mail. Use our service and subscribe to the copper market news – free of charge, and you can unsubscribe at any time. I have read the data protection regulations, accept them and agree to be contacted by e-mail or telephone.